This was a collaboration piece between myself and each person photographed, intended to make a statement on the growing epidemic of transient residents of Seattle. 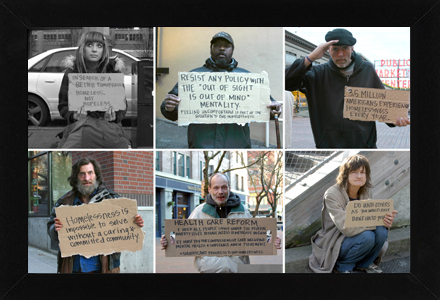 I used photography to educate the public on the needs of the homeless population directly from its victims and challenged each viewer to get involved, wait to pass judgment and educate themselves for the sake of human rights. I wrote every sign and each person chose from that collection. All were paid for their time. No one was photographed who did not initially approach me first, asking for money or work. They are all saying what they wanted to say, in a way that can be well understood, while evoking compassion regarding the subject.